SPiN New York is a 13,000 square foot table tennis social club on Park Avenue in Manhattan’s Flatiron District. The club offers unparalleled table tennis courts with Olympic quality cushioned flooring and 13 individual tables, including a stadium-like center court. In addition, SPIN New York houses a pro shop, lounge, bar, private room … and over a dozen internationally known professional coaches and players who are available for private and group instruction. One of these coaches is Wally Green – a 20 something, freestyle rapper and ping pong savant. He is one example of how the profile of ping pong has evolved from that of the bow tie wearing Forrest Gump to a new breed of young, hip urbanite. 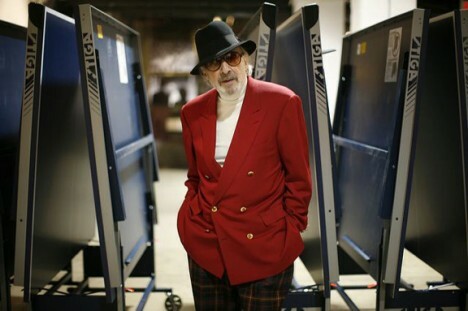 Although some of the old pros like Marty Reisman (pictured above) still chew up the tables, you are more likely to run into the likes of the Beastie Boys or model Verionica Webb tossing back a martini while hitting the ball back and forth in their Vans and Manolos (respectively). Image of Marty Reisman (table tennis champion) by Tyler Askew of Maround.com.